2016 has seen the introduction of so many online casinos among which is Amazon Slots, named so because of the rainforest theme, not because of any connection with the online retailer. With so little time to get themselves geared for the industry, it's still difficult to determine whether or not Amazon Slots Casino's efforts have been enough to ensure a lasting presence although we will unveil all available information in our review below. The company behind this new casino is Jumpman Gaming. They've been around since 2011 and have acquired several online Bingo brands which are also aimed at the European market. More recently they've switched their focus to the slot machine market and have some noteworthy brands to speak of such as Top Dog Slots and Slot Shack. While they are also still fairly new to the industry, having the backing of a parent company like Jumpman Gaming makes a huge difference for a startup like Amazon Slots Casino. Despite the origin of the name, Amazon Slots Online Casino seems to have their key focus the European market, more specifically the UK. It thus makes sense that they've been issued a trading license by the UK Gambling Commission. While this does allow them to trade in the United Kingdom, there are several noteworthy countries where they are restricted such as the United States, Italy, Spain, France, South Africa, Russia, Belgium, Denmark, Indonesia, Turkey and Malaysia. Staying true to their target market amazonslots.com only offers one language and one currency which as can be expected are English and GBP. In order to provide their members with the best entertainment solutions an online casino needs to partner with some highly reputable software developers to provide them with worthy games. Amazon Slots Casino games include only three such developers but the ones that have been chosen are some of the best around. These are NetEnt, NextGen Gaming and Eyecon. Eyecon is a lesser known company but have gained a reputation for creating some stellar games. And we all know NetEnt already. NextGen Gaming is a Sydney based company and are known for their focus on creating incredible slot games. Using the InstantPlay feature that allows games to be played directly via a browser they've managed to add convenience to their players by not forcing them to download content first, all while maintaining the quality of their games. This feature also allows them to seamlessly integrate their games to a mobile platform. NextGen Gaming is also responsible for introducing several gameplay features to the slot world in the form of Superbet, Select-a-play, Up Wild and Slide a Wild. Each of these innovations enhances the gaming experience and puts the power of the game in the hand of the player by customizing the experience towards their individual style. The game' focus at Amazon Slots is, as the name suggests, on slot machines. Parent company Jumpman Gaming seems to have a trend of creating an entity like this and only including a single game genre which is unusual but they surely have their reasons. 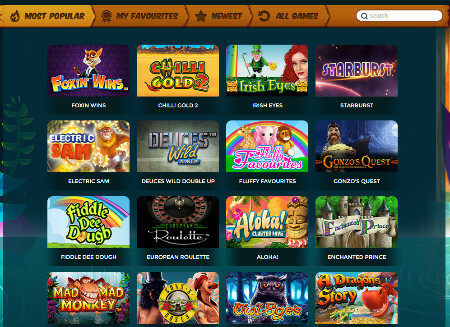 Some of their most popular slot games that are currently available at Amazon Slots Casino are Foxin Wins, Starburst, Chilli Gold, 2Irish Eyes and Gonzo's Quest. Today no slot game selection is complete without some branded slots. More and more people are spending time on branded slots from a movie or series they enjoy as this provides an added element of excitement. Popular branded slots include Mötorhead, Jimi Hendrix, Guns N' Roses, Jack and the Beanstalk and the Three Stooges. An oddity we found when browsing through the list of games is that not all of these are slot games. Included in the list is also a range of table games such as Blackjack, Roulette and Keno and also some video Poker titles. What is odd though is that there is no option to sort only according to those genres meaning that for any genre that players are looking for they'll need to sift through the entire selection to see if it's offered. This is a tedious process already having to browse through so many different titles but what makes this worse is that viewing all games only displays a hand full of titles and to reveal more the player will need to scroll to the bottom of the page to trigger additional displays. While this works well in concept, the Amazon Slots games on the website responds incredibly slowly so each time a new group of games need to be loaded it seems to take forever. Unfortunately the brand does not offer a free play option for any of its games so players will be forced to put their cash down even when trying out a new game their not familiar with. They do however put a lot of emphasis on mobile gaming and offer most of their games on mobile as well. Those who enjoy putting in a few minutes of game time while on the move should therefore be satisfied with the Amazon Slots Casino Mobile platform . Customer support at Amazon Slots Casino has its ups and downs. Support is available Monday to Friday from 9:30 to 18:00. Since their entire target market only uses one time zone it makes sense that the operator does not offer support in the middle of the night, but weekends are generally the busiest times for an online casino so not offering weekend support or even late night support is insufficient. The next thing to notice is the FAQ page and live chat option, which don't exist. Generally when a player is in need to customer support, they tend to consult the FAQ section first as that is where all the commonly asked queries are posted and should make for quick solutions. Failing to find a solution there players will then try to contact support, the most popular method being live chat as that takes minimal effort and should result on quick resolutions. On the positive side though they do offer some support methods that are not typically included. When viewing their support page a button is presented that links to the Amazon Slots Casino Facebook page where players may leave a comment which can then be responded to later. They've also made a mobile number available that can be used to contact the support team via Whatsapp, which we suppose can function as a live chat replacement when managed correctly. They also have the traditional email and phone support available. A casino is simply not complete without any bonus offerings to keep their players excited. Luckily Amazon Slots Casino bonuses some good offers as well as additional offerings over the holiday period. Here is a breakdown of the special promotions to be found here. 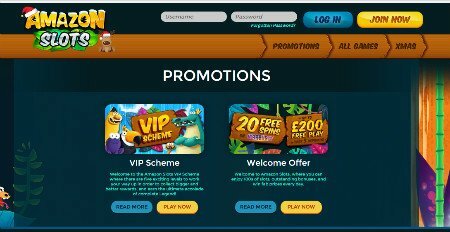 To attract new players to their website, Amazon Slots welcome bonus offers a traditional package that could reward players with up to £600 in additional playing funds as well as 60 free spins. This bonus is broken down into three deposits, granting a 100% deposit bonus up to £200 & 20 free spins to be used at the Starburst slot game. To qualify for the welcome bonus players will need to deposit a minimum of £10. There is also a wagering requirement that needs to be met before bonus funds may be withdrawn which in this case is 65 times the deposit amount plus 65 times the bonus amount as well as 65 times the amount of winnings gained from the free spins meaning that if £10 was deposited and £10 given as a bonus the player will need to wager a total of £1950 before they'll be able to request a withdrawal. This is frankly a little ridiculous since most online casinos only require a 30x to 40x wagering requirement and that's only on the bonus amount, not the deposit amount as well. In addition, if any player is lucky enough to wager such an amount by only using the bonus funds then they will only be able to cash out a maximum of £500 in winnings. It would seem that the welcome bonus is simply a way to lure new players, not to actually reward players for signing up. 'tis the season for giving and as such Amazon Slots Casino has seen fit to include a number of special promotions just for the holiday period. Players who log in on Sunday, the 4th of December would upon login immediately be credited with 10 free spins to be enjoyed at Sugar Train Xmas. Keep in mind that the standard wagering requirement applies to any winnings from these free spins. Players who get back to playing just after Christmas will be rewarded with 20 free spins when depositing a minimum of £10 on the 27th of December. It's important to remember that the bonus code "SANTA" needs to be used to claim this bonus. Additional bonus offers will be given on the 11th, 18th, 25th and 26th of December but these are being kept as a surprise. Players who log in on those days will be able to see what the bonuses are and how they can benefit. Amazon Slots Casino has seen fit to add some flair to their VIP program. This program does offer a number of tiers but no longer will they be upgraded from Bronze to Silver all the way to Diamond, instead the tiers start from Newbie and grow to Regular, Pro, VIP and finally Legend. New players will automatically be added as a Newbie member and may start to reap the benefits. Climbing up the ladder is a simple process of playing more games to earn Kudos. Once enough Kudos have been earned and advancement will be waiting. Benefits included in this program include a birthday bonus which is available to all members, cashback bonuses on deposits (only from Pro level and up) and free spins on deposits (available to all members except Newbie). Reaching Legend status requires a total of 5,000 Kudos and will mean that players will receive a 10% weekly cashback on their deposits and also 50 free spins on every deposit of £10 or more. In order to keep the higher statuses, players will need to meet a monthly wagering requirement which is £1,000 for pro level players, £5,000 for VIP and £20,000 for Legend. Banking is another category at Amazon Slots Online Casino that lack some variety. While it can be a lot of work to implement additional payment methods, this adds a lot of convenience to the player experience which cannot be substituted by anything else. Unfortunately the brand only offers 4 payment methods including Visa, Mastercard, PaysafeCard and Pay by Mobile. Including the option to do mobile payments is a welcome feature but the exclusion of all eWallet payment gateways will definitely be a black mark for many players. Any withdrawals requested by customers will be subject to a 48 hours pending period during which it will be assessed. After it's been approved the payment will be submitted which will take an additional 7 to 10 working days. There is also a limit to how much may be withdrawn which is set to £1,000 per day, £3000 per week and £5000 per month. While this should be enough for most, Legend VIP members may find this too low considering they need to maintain a wagering requirement of £20,000 per month. Casino Amazon Slots has utilized their theme of choice rather well. The website is colourful, quirky and includes some great graphics and characters. They layout is also fairly easy to use with the registration and login options right at the top of the page and a simple navigation bar below that which leads to the games and promotions pages. Any other links that may be required will be found at the bottom of the screen. The home page also displays a recent winner bar that scrolls through the names of recent winners as well as the amounts they've won. amazonslots.com still have some big gaps to fill before they can be taken serious as an online casino. They do have a good slot game selection available as well as a few table games but they only let players scroll through the entire list of games without a sorting option. They also have some decent bonuses and VIP program although the wagering requirement links to the bonuses is simply absurd. Furthermore, they are also lacking in the number of payment methods available as well as support hours and options. Truth be told, we've seen start-up casinos with much more to offer than Amazon Slots Casino so it's difficult to recommend them above the competition. If they are serious about a future in this industry they will need to step it up soon.